La Pellegrina is one of the most luxurious villas of “Pearls of Crete” complex which is located in the coastal area of Makri Gialos in Crete. The “La Pellegrina” villa which covers an interior area of about 215m2, is developed in 3 levels and spares about 200m2 of gardens. It features a heated private swimming pool, 4 spacious bedrooms and 4 bathrooms and can accommodate a maximum number of 9 Guests. The beautiful beach of Makri Gialos is just down the road and reachable on foot within a couple of minutes. 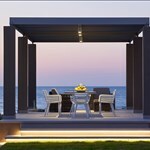 La Pellegrina, like every other villa of the Pearls of Crete complex, is an energy efficient house which has been built using the latest energy saving building materials and techniques. What this means in practice that the villa stays cool during the warm summer days of Crete and warm during the mild winters, saving energy and Earth’s valuable resources. Having as a principle values such as complete satisfaction of the customer and respect towards the environment and the traditions of our homeland, the owners and constructors developed the “Pearls of Crete” in the region of Makri Gialos of Ierapetra, South East of Crete. A total number of 15 luxury villas and 9 apartments are here to offer you a high standard of living and unique moments of relaxation. Heated swimming pools, barbeque corners, full planted gardens, under floor heating, air-conditions, steam shower and water-massage devices are some of the equipment that every property can provide you, aiming to the complete satisfaction of your desires. In addition, every property is developed taking into account the economic efficiency and equipped with the latest energy saving systems. A human friendly house means an environmental friendly house. Breathtaking coasts, dense forested mountains, over 330 days of sunshine per year and a mild climate, are the elements that compose the unrivalled beauty of the natural environment of Makri Gialos. The area that the Minoans had chosen for recreation and relaxation can become your own destination that provides you with unforgettable experiences. 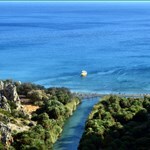 Traditional Cretan villages, scenic bays and unique routes compose a really inimitable Mediterranean landscape. Makri Gialos – a vivid and hospitable place that is ready to welcome you, offering to you all the services and comforts that you seek for. People, tradition, hospitality, eating habits. 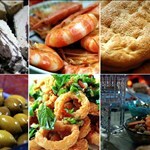 These are the four attributes of Crete that keep this island alive and imperishable in the passing of years. A vivid and blessed place, full of habits and traditions, mild developed but on the contrary with unlimited recreation and relaxation capabilities all year long. Come to relish the pure products of the Cretan Soil – Tsikoudia, Wine, Olive oil – and experience the Cretan way of life that gives felicity and longevity. Crete. Place to live. Way to live.